This is a brand new effort and has cost very little so far, but it will start to get expensive, even with everyone contributing their time. That makes it necessary to raise operating funds. If you like what you see here and would like to support it, please make a tax-deductible contribution of whatever you like. I will create a page here to acknowledge you; if you write a note I will publish that too. 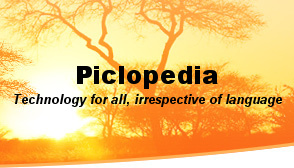 Piclopedia does not yet have a bank account. I will set one up soon and then create a PayPal link so you can make contributions on-line. For now, however, if you wish, you can send a check or money order payable to Terra Segura International, 1219 23rd Street, San Diego, CA, 92102, USA. Please write "Piclopedia" in the memo space. We will send you a receipt for your records.